Wanting to Sell an Affordable, Pre-Made, Minimal Setup Waterfall Scrubber. Need a Consensus! View Poll Results: Are you interested? Thread: Wanting to Sell an Affordable, Pre-Made, Minimal Setup Waterfall Scrubber. Need a Consensus! I haven't had an account long on the site but I've been following along for years... First off, I wanted to thank you all for contributing so much to what we now know about scrubbers. We now know some of the most effective methods to filtering our tanks thanks to all of you! As a quick background on myself, I'm a 100% disabled Army veteran currently going to school full-time for CAD. I've been into aquariums for a long while and I've been into reef tanks in particular for the past few years. I love drawing, drafting, designing, and building things in my free time. More recently, I designed an acrylic waterfall algae turf scrubber influenced by several popular designs. You'll notice I'll never claim credit for the design because it's unethical and misleading, although I did add some of my own elements that have helped tremendously in my personal scrubber. After deciding that I wanted something to get into for fun in my free time while providing an affordable solution to cut out some of the DIY challenges many members of this forum have faced, I came up with an easy, cost-effective design that I think will save a lot of headaches. I'm not looking to make a killing (mainly just compensation for my parts and labor) and I'm certainly not looking to step on the toes of anybody who has already designed a pre-made scrubber. I'm just looking for a way to help some folks out. My role isn't to re-invent the wheel. My role is to save others the trouble of building the "wheel". I have a solid, simple design based on what has worked very well for me. I've done a lot of pricing on supplies and I think I can make you guys some pre-made scrubber packages at a few different price points depending on your needs. -The scrubber is a basic box design with a lid to prevent splashing, light spray shields, a main drain, an emergency drain, and all the necessary plumbing/tubing (pre-assembled) to get you started. -For the final price point which won't come out for a few months at least, I'm looking to keep it under $300 at the very most and this will be a complete setup, lights included. I just don't want to put out a setup with inadequate lighting that's going to cost an arm and a leg. I'd rather give you guys the choice on your own lighting. I can also point you guys in the right direction on some lights that have worked great for me! -The scrubber will filter up to 5 cubes of feeding per day which I can assure you works great, because it's nearly identical to the setup I'm running now. Of course, you'll be able to adjust the screen size to your own needs. So my question to you guys... I've already got a few folks locally that are very interested but I need to get a consensus on how many of you on the forum would be interested so I know how many supplies to order... So, who's interested? Please post in the comments below or shoot me a PM. And again... I have the utmost respect and gratitude to the fellas who have made algae scrubbing what it is today, to include those who have already designed VERY nice scrubbers. I'm just looking to help some people out and help make further strides in the hobby. 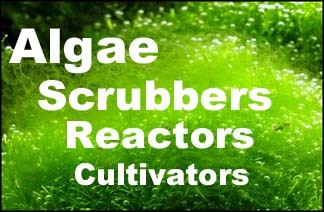 Big shout out to Turbo, SantaMonica, Expressions LTD, and all of the algae scrubbing community! Thanks!